Aidan McHugh proudly shows off the trophies he won in Dubai and Liverpool. Bearsden teenage tennis star Aidan McHugh has set his sights on continuing to climb up the international rankings after closing 2015 in spectacular fashion. The 15-year-old enjoyed an impressive breakthrough on the International Tennis Federation’s Under-18 World Tour where he plays against players up to two years older than himself. And Aidan, a fourth year pupil at St Aloysius’ College in Glasgow, finished the year having claimed his first two victories in under-18 international tennis, winning back-to-back championships and leaping up the rankings. 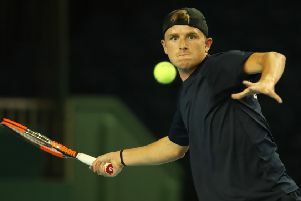 His first triumph came in Dubai when he came from behind in the final to beat Romanian, Daniel Cozma 4-6 6-2 6-2 and. That outstanding achievement was quickly replicated when he won again in Liverpool when he beat fellow Brit Damien Rodriguez, again in three sets, to lift the Nike Junior International Championship. His under-18 ranking rocketed from 850th to 454th and he expects to climb to around the 300 mark once older players move up a catepory. Within his own age group he is thought to be around 20th in the world, but despite his success Aidan is keeping his feet firmly on the ground and his mind on both tennis and his education. He said: “I think because my school encourages you to make the most of your talents it’s easier for me to dedicate time to my tennis.